Every review I’ve read so far about the Apple Watch has been written by a bloke who works in technology. That’s great, but as a woman who works in finance, it’s not always relevant to how I would use a product. I knew I wanted an Apple Watch from the first rumours that went round. I was off work on the day of preorders, so I bounced out of bed and had my laptop open at 7.59 to try and buy it through my company discount link (annoyingly that didn’t work!) and I had my iPhone open to the Apple Store app to buy the Watch I had saved in my favourites, which is how I ended up with a 38mm Watch with classic buckle. As soon as 1pm hit, I strapped the watch on and we headed to our favourite sandwich shop. 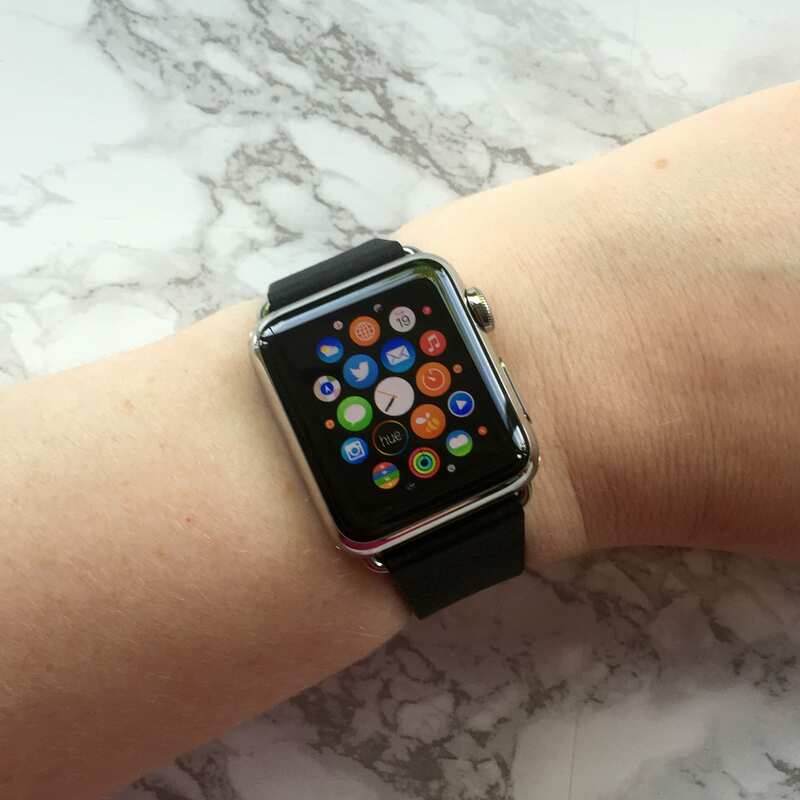 It’s super easy to set up – turn it on, and use the Watch app on your iPhone to take a pic. By the time I had ordered a delicious and over filled sandwich, my Watch was ready to go. Except I had no idea what to do! Now I’ve had it for about a month now, it’s not a distraction at all. I have it on silent most of the time, so I just get haptic feedback for notifications (which is like vibrations). It’s useful for notifications, like reading a text message while I’m cooking dinner without having to put everything down to find my phone. I went for the 38mm, while Alex went for the 42mm. It doesn’t sound like a huge difference in size, but I’m glad I went for the smaller one because it’s the right size for my wrist. If you’re considering one, go to an Apple store to try it on. I did (after placing the preorder) which was an interesting experience. The way it was dealt with was unlike anything I’ve experienced at an Apple Store, and more like buying a watch at a jewellery shop. I read a review recently where someone said they were asked about the watch and felt like they were disappointing others when they said it wasn’t life changing. I’ve come across that as well, people want you to say THIS IS AMAZING! IT CAN DO ALL THESE THINGS! It’s cool, don’t get me wrong. I’d still buy one, even after trialing it. I’ve only had one day where the battery died in the middle of the day – still havent worked out why, but it’s not a normal occurrence. I like being able to pay for my Starbucks with a flick of the wrist (wait that sounds wrong) and when we get Apple Pay in the UK, it will be awesome to pay for things. So. Apple Watch. Get one if you want one. Don’t bother if you aren’t that bothered. Hahaha flick of the wrist. You are a great reviewer!